2019 Prepaid - What Do Trends From Previous Years Say? 1Q19 Earnings season is about a month away. Postpaid gets much of the focus because it brings in revenues and because it's a big chunk of the bread and butter revenue of many carriers. However, though prepaid is a minor asterisk on many carriers, it doesn't mean that competition isn't just as formidable. Trends could be a good predictor of future performance. For every earnings call, I try to display a couple of years worth of net additions or losses on Twitter and occasionally, I write a blog or two. Let's look at the previous years' aggregate results and see if anything is interesting. It's clear the biggest loser was America Movil (Tracfone) as a huge loss factor was the lifeline brand, Safelink. Tracfone was once a huge prepaid force to be reckoned with and to be fair it still is. At the end of 2017, it had over 23 million customers. Verizon didn't have a bad 2017. As the company is over 90 some odd percent postpaid. It didn't seem like a huge impact, as the carrier stated its intent to move feature phone subs off its 3G network and onto higher ARP bearing smartphone plans. Sprint looked like it was recovering and turned the corner from abysmal years '15 and '16 due to Assurance Wireless losses, their lifeline brand. The Sprint prepaid group's flagship Boost Mobile continued to contribute as Virgin Mobile seemingly didn't help the cause. Lastly, the T-Mobile and AT&T fight was the most competitive. The real story behind those two companies' momentum is the respective purchases of regional players MetroPCS and Leap Wireless (Cricket). T-Mobile dominated all of '15 and '16 as it expanded its distribution doors beyond the MetroPCS footprint. AT&T used the same playbook in revamping and expanding Cricket's distribution nationally. Within the weeds, 2Q17 was the inflection point in which AT&T led for the remainder of the year. This is important as AT&T and T-Mobile are emerging as the dominant prepaid forces. America Movil continued to lose! Persistent blame was cast on its lifeline brand. Corporately, it appeared an underlying industry strategy was to embrace the higher ARPU bearing and flagship Straight Talk brand for sub growth and revenue. Straight Talk now makes up ~9.1 million out of its overall 21.7 million base. The higher ARPU strategy yielded positives as its overall corporate end of year ARPU hit $26 vs '17's $24 vs '16's $23. In addition, the overall corporate churn trend continues to improve. 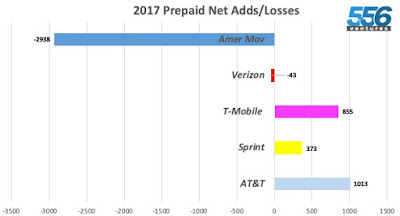 While Verizon '17 prepaid looked encouraging, '18 saw significant prepaid losses. Its sub base is barely 4 million and while there are some who point to the semi-linked Visible brand to address its prepaid ambition, it's a tough and price sensitive market. Sprint was supposed to have turned the corner in '17 but you would have been wrong for '18. 1Q18 saw some good momentum but in the end, 4Q18 tanked. Clearly Sprint is more focus on good postpaid numbers, as it even categorized some Boost Mobile users with a good payment record and moving them into the overall postpaid count. Again, the AT&T and T-Mobile dynamic proved to show the most interesting outcomes, as the two continue to battle it out for growth. 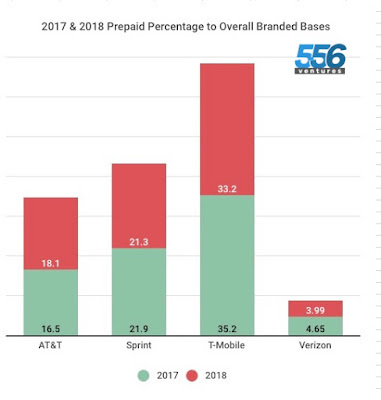 Throughout '18 prepaid adds slowed with T-Mobile claiming that the prepaid-postpaid lines have blurred significantly. There are a combination of factors perhaps, like any competitor, the carrier would rather spend its resources into higher-ARPU bearing postpaid users AND AT&T's Cricket has put the competitive screws on Metro by T-Mobile. The big BUT is in 4Q18 where unexpectedly, T-Mobile came roaring back, besting AT&T. With its positive momentum, AT&T should have dominated 4Q18 but its branded prepaid tanked the numbers. Still, overall in '18 AT&T was the net prepaid winner. With abundant losses behind it, America Movil may cross into positive territory in 2019 as its losses were ~100K in 4Q18. The first quarter trend for each year typically carries over some of the 4Q momentum. If that is true, then American Movil may potentially see '19 as a turnaround year, barring overwhelming competition. The increasing ARPU trend is likely to continue as it's likely the company will add more resources into getting more Straight Talk traction. Though Verizon as its 4Q18 losses only amounted to 90K as nearly 600K of its overall '18 losses happened in 1H18, it seems to be on the upswing. Yet, the jury is still be out as Verizon doesn't really seem to address its offerings competitiveness to grow or retain its prepaid base. Sprint is a big unknown. Through earnings calls, filings and market looks, Boost Mobile seems to be holding its own while seemingly Virgin Mobile is a nob-contributor. The trend is negative as Sprint, which once was a significant prepaid player is inconsequential as far as marketshare. all the indicators are going in the wrong direction, their churn is up and their prepaid ARPU is declining. The growth money still in on AT&T's side as its prepaid momentum is greater than T-Mobile's. 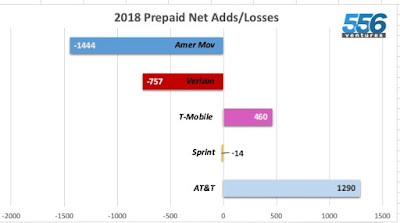 If one extracts the 4Q18 glitch, AT&T continues to be the growth leader, barring additional AT&T branded prepaid losses. The bottom line is that both companies would continue to shape 2019 prepaid growth. Finally, here's how the prepaid business units shape up versus the overall branded base to note who is shrinking and contracting.